Jalandhar: Thousands of Lovely Professional University alumni from Canada, America, England, Bangalore, Hyderabad, Mumbai, Delhi and more gathered at LPU campus for inaugural annual alumni meet ‘Home Coming-2017’. LPU had planned this grand alumni meet to recognize and celebrate the global achievements of its eminent graduates. Utilizing the whole day to the full, LPU alumni from all over the world and the country became nostalgic and shared great memories of the yester years with their teachers, classmates and friends. Full of deep seated emotions, alumni accessed their respective class rooms, tens of sports ground where they used to play different games; hostel rooms where they lived home like life; met their mentors and teachers who shaped them to be truly global citizens; and, relived varied experiential moments of meaningful and fun-filled days spent at their alma mater- LPU. Celebrating their massive gathering, all of them left no stone unturned to make their stay at the campus, once again, a great day of significance and of ever cherishing moments. LPU alumni also came forward with corporate social responsibility and donated 200+ pairs of shoes and stationery items to the poor children of the nearby villages. LPU Chancellor Mr Ashok Mittal welcomed them all at the campus and blessed them to bring more name and fame to their parents, themselves and their alma mater through illustrious contributions to the global society for noble causes, progress, peace and harmony. LPU awarded scores of its illustrious alumni in recognition of outstanding accomplishments, recognitions earned & CSR activities made in their respective field of endeavours, and for bringing prestige to the alma-mater. They were honoured for being great researchers, entrepreneurs, leaders, brand ambassadors in their fields and more. One of the alumni, Rahul Tyagi (MCA-2011) is honoured for his entrepreneurial endeavours for ‘Training at Lucideus’. His this company has 5 offices in top metro cities of India & the USA with gross turnover of Rs 40+ crores. Alumni Award 2016-17 for ‘Excellence in Academics’ were bestowed upon Dr. Vijay Kumar (Ph.D. – Chemistry (Full Time -2011) who is presently Research Officer with Government of India; Parul Sharma (BCA 2013), presently Cyber Security Professional at New York University; and, for performing arts upon Mohit Kumar (B. Design -2015) who is many awards winner ‘Film Maker’ & founder of Jovial Productions. Both Rahul Bisaria (B Tech CSE-2011), Specialist at Verizon Data Services India Private Limited, and Sunil Nagpal (B.Tech Biotech-2011), who is Researcher at Tata Research Development & Design Centre, have received Professional Excellence awards. Founder & CEO at (Smiles Care/Simbacart/SimbaQuartz) and Philanthropic Adviser Mandeep Kaur (BBA – MBA-2011) has been recognized as Social Entrepreneur. Similarly, Founder CEO at Vélmenni, Deepak Solanki (B.Tech ECE-2011); and, Co Founder and Embedded System Engineer at TechKilla, Yashi Mishra (B.Tech ECE-2014) are awarded for Technology Leadership. The best alumni chapter award is presented to alumni association ‘Hyderabad Chapter’ in appreciation of its continued commitment to the LPU vision, growth and development of the society. Similarly, Parvinder Singh, working in Business Intelligence Amazon; Harleen Thind, Engineer at Microsoft; Neha Mahajan, System programmer at Yahoo; Navtej Singh Sandhu, working in Apple; and, Utkarsh Gautam, working in Google, all at more than Rs One Crore rupees are honoured as LPU Ambassadors. Bharat Gupta working with Samsung R&D has been awarded for his valuable support in creating opportunities of growth for fellow students and the Alma Mater. Awarded for Entrepreneur Achievement, LPU alumnus Rahul Tyagi has created great social impact through his company ‘Lucideus’. An LPU student of MCA-2011, Rahul has many offices for his company in Bangalore, Ahmadabad, Mumbai, New Delhi & the USA, with gross turnover of more than Rs 40 crores. Lucideus has also been awarded as the Best Startup of India award under the IT (Information Technology) and ITES (Information Technology Enabled Services) category at the National Entrepreneurship Award 2016. Rahul has also been awarded to be in Blackberry Hall of fame. Rahul has worked for a lot of security applications and his company has also worked on government project ‘Bhim App’ to support PM Modi’s favourite “Notebandi” processes in India. Awarded for Social Entrepreneur Achievement, LPU alumna Mandeep Kaur (Sidhu) Kalsi is a student of management and presently a great Social Entrepreneur. 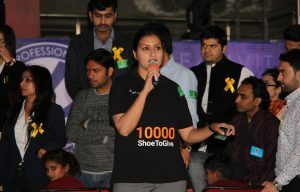 She is also a philanthropic adviser and aims to donate one lac pairs of shoes to poor children through her network in India and US. She is also founder & CEO at Smiles Care, Simbacart and SimbaQuartz. Her first venture Simbacart has won “Upcoming Start Up of the Year 2016” Award by ASSOCHAM. She is very popular on social media and has earned 329,400 likes on Face book, and has 26700 followers on LinkedIn. On this occasion, annual elections for key positions of 13 chapters of LPU international and national alumni associations were also held. Alumni took active part in election processes and voted online from prestigious countries including the USA, UK, Russia, China, Canada, New Zealand, Singapore and many more. Bharat Gupta (B Tech CSE 2011) has been elected International President of LPU alumni association, this year; whereas, Priya Malik (B.Tech. – M.Tech. Biotechnology Integrated 2011) as Vice President (National); Hitesh Sharma (B.Tech-M.Tech CSE 2011) as General Secretary; and, Navya Reddy Sane (B.Tech ECE 2014), Sharmili Ghosh (MBA-2016), Tanvi Gupta (B.Sc Biotech-2016), Monika Pathania (MCA (Hons.-2014), Arundhati Gupta (B.Tech M E-2016), Sahil Khanna (B.Tech ECE-2012) & Aditya Prakash (B.Tech 2013) as Executive Committee Members.